Ahh, Northern Arizona. Big trees, big mountains, and a big lie. 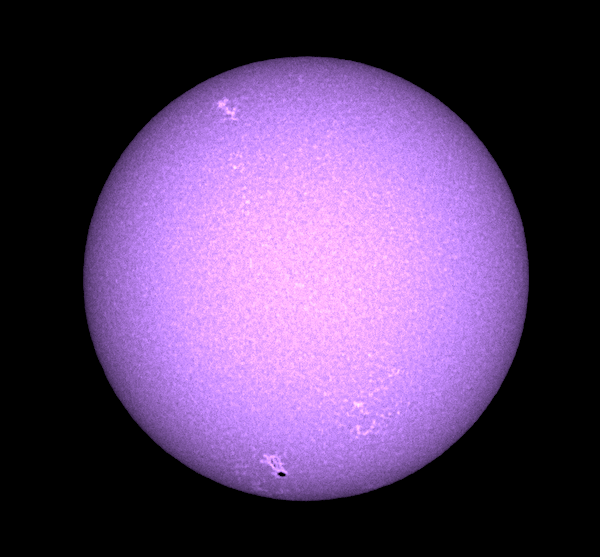 I set up my two solar scopes during the day, and my Celestron 6 telescope in the evening at a relative's house over the Memorial Day weekend holiday and failed to take even one picture of firing up my Lunt 60mm Calcium K-line telescope, so I faked the picture above just to give you an idea of what the event was like. It almost looked just like that. The first weekend in June I set up everything again behind the warehouse at work. A nice view, but nothing like the Flagstaff area. Present above is the new to me Lunt 60mm Calcium scope, "Calvin", on the left, and my Lunt 60mm pressure tuned, double stacked Hα scope, "Agena", on the right dual mounted to my Losmandy GM-8. My Toughbook for camera operations is in the shade box on the table. They all get along so well. 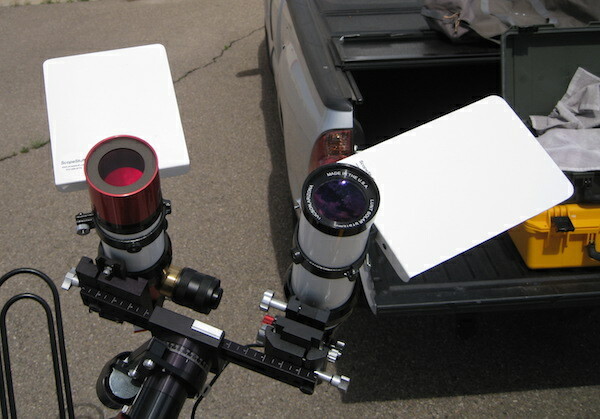 The new telescope has a focal length of 500mm, and the Ca-K module/diagonal is a B1200 (1.2cm) size. The serial number starts with "2008" so I'm guessing it was made in 2008. It has a 2" Feather Touch focuser. They're nice. You can't see much through an ocular on a telescope set up to observe the Calcium K-line, because the wavelength of the line is about 393nm which puts it just beyond what is considered the violet end of the visible spectrum. If you are a whipper-snapper you may see a little, but I could only make out that there was a large purple spot in the ocular. No details. 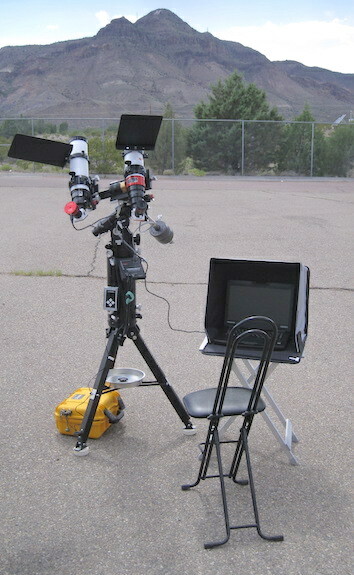 You need to observe through these scopes using a camera. I just happened to have my ASI174MM camera handy. It must be young, because it was able to show quite a bit of detail. 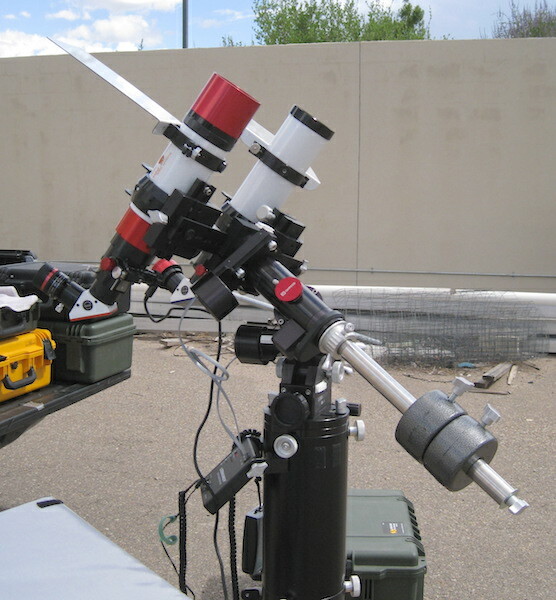 Each scope has a magnetically mounted Tele Vue Sol-Searcher, because each telescope's pointing can be independently adjusted. Here I have Calvin mounted on an ADM Mini-Max guide scope bracket. Once I have the GM-8 positioned so the Hα scope is on the Sun I can adjust the ADM bracket and get the Ca-K scope on target at the same time. I pulled out many hairs trying to do this before I bought the adjustable bracket. Get the bracket. It's pricey, but I'm worth it. The birds sing, the bees buzz, and all is right with the world when aligning the two scopes with the bracket. This Mini-Max model is supposed to be good for scopes up to 10 pounds. These scopes are around 13 pounds. It seems to work fine for solar stuff where the alignment isn't as critical. I can't see any flexing or anything. I think it would be fine for more demanding stuff too. 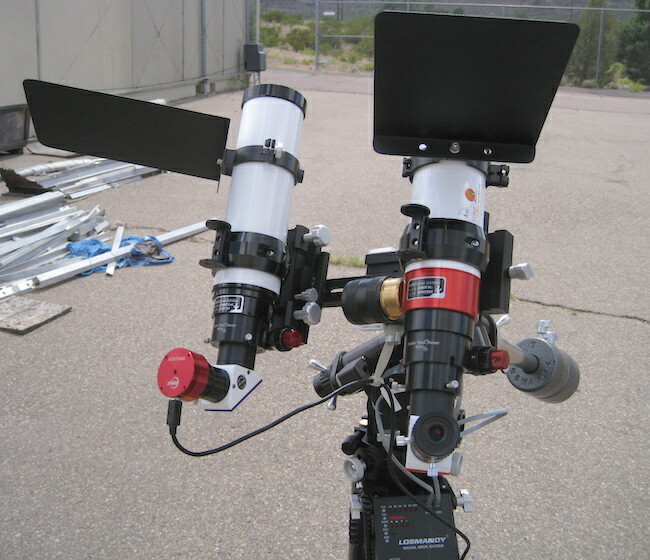 They make a second model for telescopes up to 25 pounds, and a third one for even larger loads. The bracket doesn't help with clouds, but making the birds and bees happy is not a bad thing. I like Using the ScopeStuff solar shields when doing stuff in the Sun. They block just the right amount when you don't have the whole mount covered with Telegizmo's reflective blankets. They also kinda hold the blankets up off of you a bit when you are using them. The Charlie Bates folks that come through town had them on their scopes way back when and I just copied them. While getting things aligned I just rotate them out from in front of the Sol-Searchers. Once everything is pointing the right direction the shields can be moved into position even if they block the Sol-Searchers. 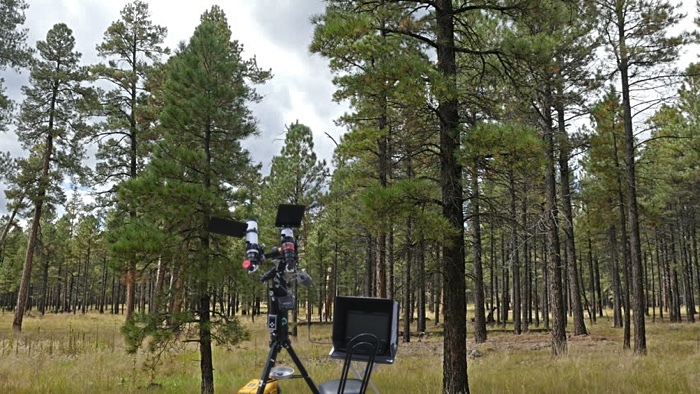 I move the shield around quite a bit on the Hα scope when using the eyepiece as the pointing direction changes and the height of the observers change. Just a picture from the other direction. The stuff laying around on the ground is construction leftovers from the Magdalena Ridge Observatory. They share a warehouse with us. I didn't take a picture of the mountain of our crap on the other side of this enclosed area. I only took a few shots through the scope to test that it was all working. Above is just a single shot quickly altered (using Apple Preview) false-color picture. The camera is only black and white. I figured no one would look at the picture these days if it wasn't in color. This one was from back on May 27th. Solar North is on the right. It was interesting comparing the views from each of the scopes, in real time, and on my own mount! Very cool. One improvement to this system would be trying to shoehorn a Celestron 5 that I have operating in white light in there somewhere. The Hα pressure adjusting knob is the problem. It throws off the balance quite a bit if it hangs over the end of the V-bar, instead of being in the middle like it is now. Having it point up doesn't seem like a good solution. I'd worry about dripping grease into the etalon. I'd have to buy another ADM Mini-Max. That might hold things up for a while. I'll add a JMI MotoFocus package at some point. That's worked out nicely on the Hα scope. Done.